The mid-June series that pitted the Milwaukee Brewers against the Chicago Cubs netted several results. First being, the fans of Milwaukee were given a reintroduction to how awesome it is to experience “playoff type baseball” in the confines of Miller Park. Second being, the Chicago Cubs are growing increasingly aware that the Milwaukee Brewers are built to win now and are likely not going away in the division race. And lastly, and perhaps most importantly, Brewer Nation is definitely taking back Miler Park!!!! 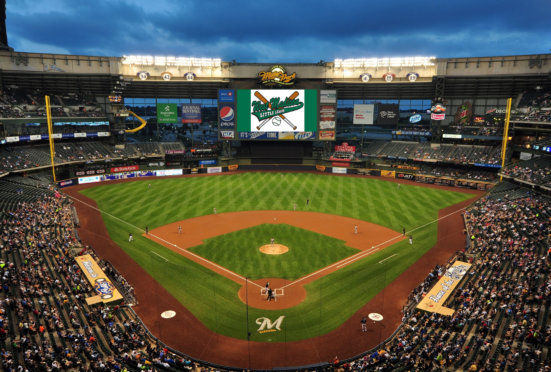 Over the course of the past several seasons, the Brewers have played host to a pseudo Wrigley-north scenario every time the Cubs rolled into town. And hard-core Brewer fans hated it. And while the object of the game is to put asses in the seats, it wouldn’t be a stretch to say the management wasn’t all that crazy about it either. Direct action was taken. Taken from the Brewers website: Beginning Friday, February 9 at 9:00 am CT, we are putting tickets for all 10 of this season’s Brewers vs. Cubs games at Miller Park on sale to Wisconsin residents only. Maybe it’s fair. Maybe it’s not. Either way, we just want to make sure Miller Park is packed with Brewers fans for these 10 crucial matchups. Fast forward to the series in mid-June and it is very easy to see that this plan of attack is working. Whlie it is impossible to keep all Cub fans south of the Cheddar Curtain for these big games, the process of taking back Miller Park has begun in earnest. Anyone that attended any of those games or watched it on TV could easily see that Miller Park is gaining back the correct shade of blue. Our cheers were louder than their cheers and “root, root, root from the BREWERS” actually won the 7th inning shouting match for the first time ever. Face it, the Cubs know the Brewers are for real. The Cubs know that their stranglehold on recent division supremacy will not continue without a fight from the north. They came into Miller Park and for the first time since they have been good again, the Cubs blinked. This is a call to all Brewer fans to keep that momentum going. Let no one come into our house and dictate the atmosphere in our building. Their home may have tradition, our home is world class. Their home has ivy, our home has everything. Their home is theirs and our home is going to stay ours. They are welcome to visit in limited numbers but may we never hear the term Wrigley-north again. Thank you Brewer brass, now let’s go win this thing.